Strawberries are one of the most rewarding garden plants, producing ripe berries reliably for several years before needing to be replaced. With proper care, site selection and maintenance, strawberry plants produce reliable crops of tasty berries in most home gardens. Follow these tips for growing successful strawberries. There are many different types of strawberries. However, few produce the gigantic berries found in the produce section of your grocery store. Alpine and Ever-Bearing plants produce smaller fruit, but they are best suited for growing in containers. June-bearing plants produce the largest berries, but they typically produce just one crop before settling in for the summer. Keeping an assortment of both major types can keep you in strawberries for most of the summer. Strawberries are quite adaptable, and many people grow them right in the ground. 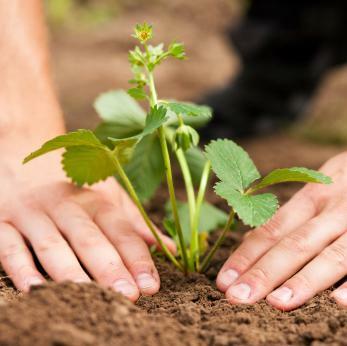 Since plants grown directly in the ground are left there for several years without disturbing them, you should choose a spot that you won't want to reuse for quite a while. It should also be near a water source since strawberries to be moist. You might also choose to grow your plants in planters, pots and containers. Special strawberry jars or planters offer multiple pockets to place numerous berry plants and grow more berries per foot than a typical planter. If you have limited places in your backyard garden that receive full sunlight, you might want to plant strawberries in pots or containers that you can place on your deck, patio or anywhere that receives better light. Plant your strawberries in a location that provides optimum conditions. You'll increase their growth and their yield. Choose a spot that receives six or more hours of sunlight per day. 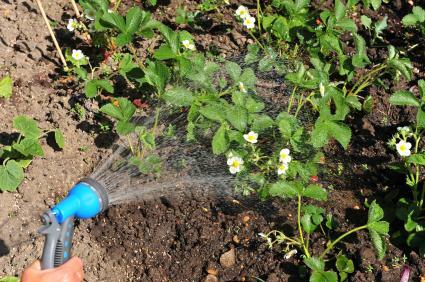 The patch should be near a water source such as a garden hose or sprinkler since strawberries are quite fussy about receiving plentiful water. Don't plant strawberries in garden beds where either tomatoes or peppers once grew. Tomatoes and peppers may carry verticillium wilt, a disease that can kill or damage strawberries. Prepare the garden soil by adding plenty of well-aged manure, peat moss and compost. Strawberries like a slightly acidic soil, and compost, manure and peat moss provide nutrients as well as improve soil structure. Turn the soil over and add amendments, mixing them into the soil. Some gardeners like to place landscape fabric, a sheet of black or dark brown loosely woven fabric, over the top of the soil on strawberry beds. This offers several advantages. The cloth suppresses weed growth, since weed seeds do not receive light to germinate. The soil underneath the cloth stays slightly warmer because the sun heats the fabric, and it retains the daily heat a little longer. Warming the plants sooner in spring sometimes helps the plants produce berries faster. Landscape fabric and mulch also reduce moisture loss through evaporation, which helps strawberry plants. If you decide to use landscape fabric, lay it down first and then cut holes or slits in the fabric to plant each strawberry plant. Add mulch over the top if you wish. 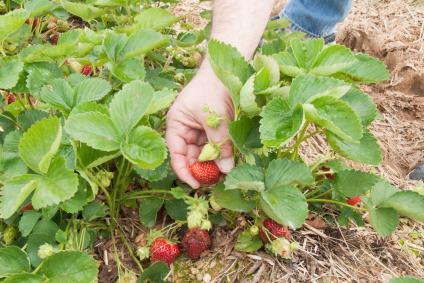 Strawberries benefit from a monthly application of a balanced fertilizer. Use an organic or man-made 10-10-10 fertilizer and add compost yearly. Strawberries like well-drained yet moist soil. You can achieve this in three basic steps. Ensure that your strawberry plants receive about an inch of water per week. Use a rain gauge to monitor natural rainfall. Supplement by watering from your hose or sprinkler if necessary. Mulch maintains soil moisture and suppresses weed growth. Weeds not only look unsightly, they also rob the soil of valuable nutrients. Gently hoe between rows of strawberry plants. Start out using landscape fabric and discourage weed growth from the beginning. At the end of the gardening season, mulch strawberries plants with pine straw. Pine straw mulch is actually made from pine needles that drop from the trees. It's airy and light enough so it won't smother delicate strawberry plants, but it will keep the crowns from freezing when temperature dip down to around 15 to 20 degrees Fahrenheit. Once the spring weather warms up and nightly temperatures do not dip below freezing, gently rake off the mulch and discard it. New plants benefit from pinching off the flowers the first year. If you don't want to pinch off the blossoms the entire year, at least pinch off the first flowering. Your plants will grow more roots. The roots will grow deeper and stronger, which in turn means a healthier plant. Subsequent crops are likely to be heavier and produce larger berries. Strawberries send out runners and grow new plants from each runner. Over time your strawberry patch may become thick with plants. Berry production may decrease if the plants become too crowded, so it's best to tackle dividing your plants in the spring before the plants begin flowering. 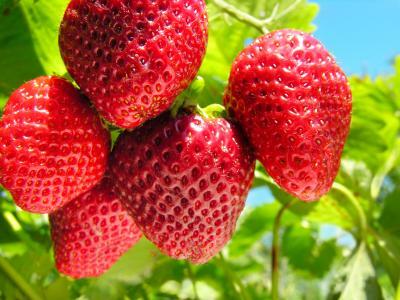 Simply dig up the baby strawberry plants and place them in new locations in your garden. Give away some plants to the neighbors. Water any newly planted strawberry plants well to help them become established in their new garden location. One last tip for strawberry care: pick berries early and often. Hopefully this won't be an onerous garden task! The more berries you pick, the more the plant produces. Picking berries stimulates the plant to produce additional flowers and berries. You can pick strawberries when the berry is nearly or entirely berry bright red. If you wait too long, insects or birds may enjoy the berries before you can. Growing strawberries offers gardeners an affordable, enjoyable way to produce fresh, sweet berries right in their own backyard. By taking these simple steps to good strawberry plant care, you can enjoy fresh strawberries for many years to come.